Our party, with the exception of Mr. Neish, and accompanied by Mr. L.J. Gallagher and Mr. J.A. Clark, drove in Mr. Clark's car from Spokane, Wash. to Pasco, Wash., by way of Coulee Dam, leaving Spokane at 7:30 A.M., arriving at Pasco at 9:00 P.M. 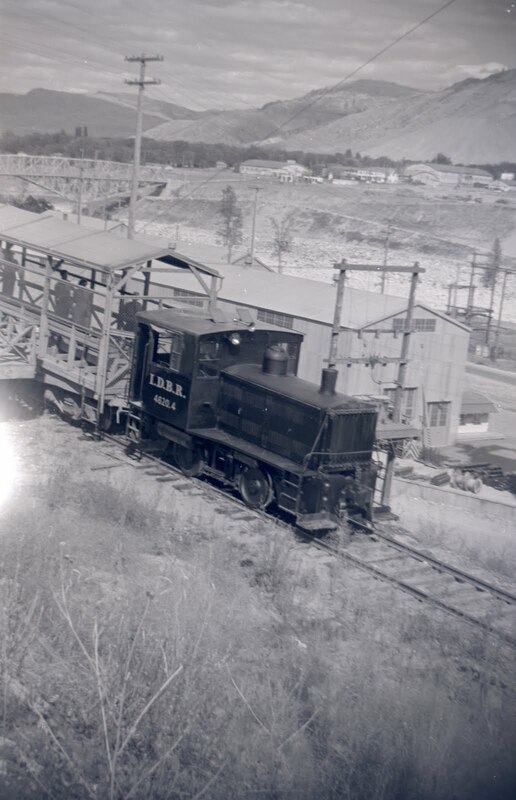 The Northern Pacific Railway Company handles considerable traffic for the Coulee Dam project, which consists principally at this time of cement in bulk loaded in box cars. This operation is carried on from Coulee City to Mason City (Coulee Dam site), by the contractor over approximately 30 miles of railroad constructed by the United States Government from Odair to Damsite. Many units of freight train cars loaded with cement were inspected. 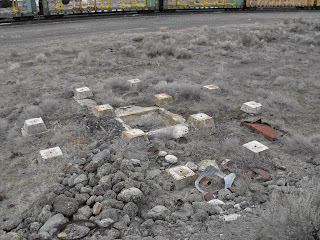 An item of particular interest was noted at the unloading platform at the Damsite, wherein a remote control electrically driven pneumatic cement unloading device is used, which works directly into the box car and picks up the cement by a screw conveyor and raises it to the air chamber and then into the near-by silos through an 8-inch rubber conduit. The device is, in fact, a robot, which moves either forward, backward, or to the right or left, as desired by the operator who remains on the platform. 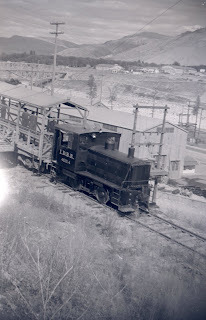 It is presumed that this device was especially devised for this job, as box cars only are available, and has been greatly improved since it was first used. Inspected from Cheney to Medical Lake. This is a rather unimportant branch, except for the temporary importance given to it by the construction of Grand Coulee Dam. It may also profit permanently if the irrigation project in connection with the dam is carried out. Present traffic consists of gas-electric passenger train each way daily, and one freight train one way daily, sometimes each way daily. The line serves some good grain country. Passing track at Four Lakes is disconnected at one end. 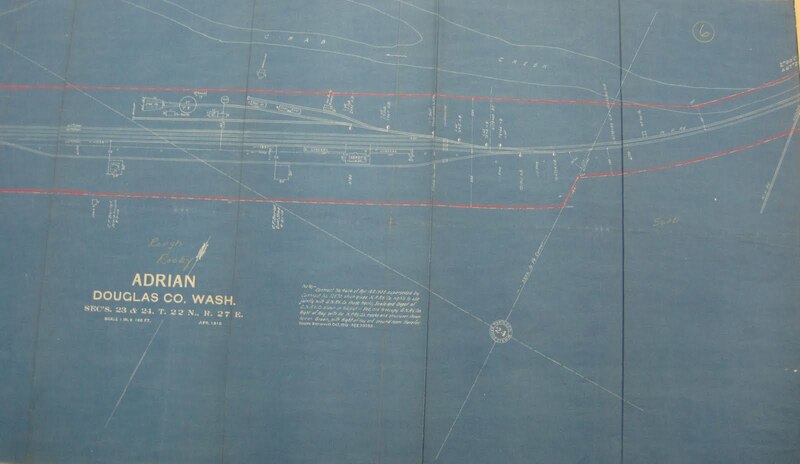 From a Northern Pacific map from 1910. From the "Columbia Basin Herald," Moses Lake, WA. The Warden Historical Society has its first home. 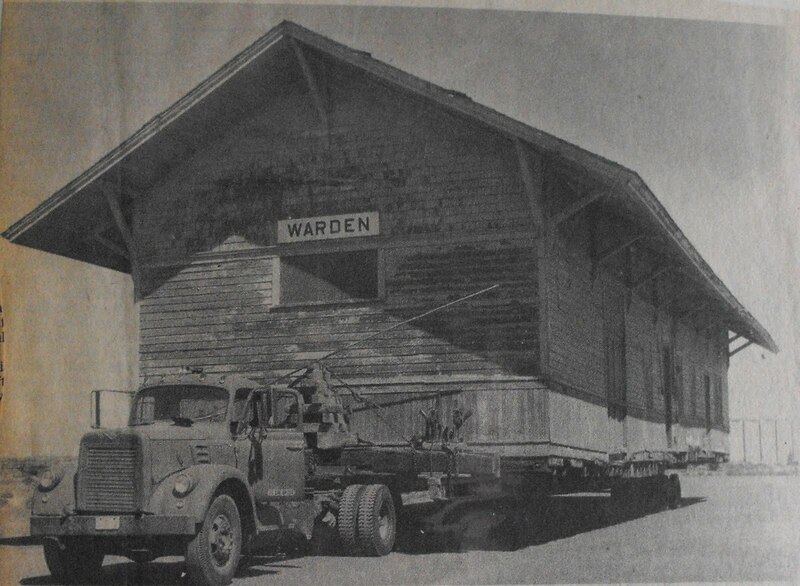 Friday, crews moved the town's old Milwaukee Railroad station to a new site between Oak and Walnut on Second. 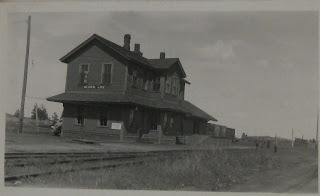 Built in 1910, the station will be renovated to its original appearance and stocked with articles from Warden's past, said Mrs. Fritz Kliphardt, a member of the historical society. She said the society was formed this year, and has been contacting people for museum articles. First shot taken around 1910. Remains of the roundhouse can be seen today, though the heavy brush makes it difficult. There is still a small depression of the turntable pit. Bigger changes, of course, are in the size of the town, smaller now, and the size of the grain elevators, bigger now. Photo courtesy of Mike Miller. 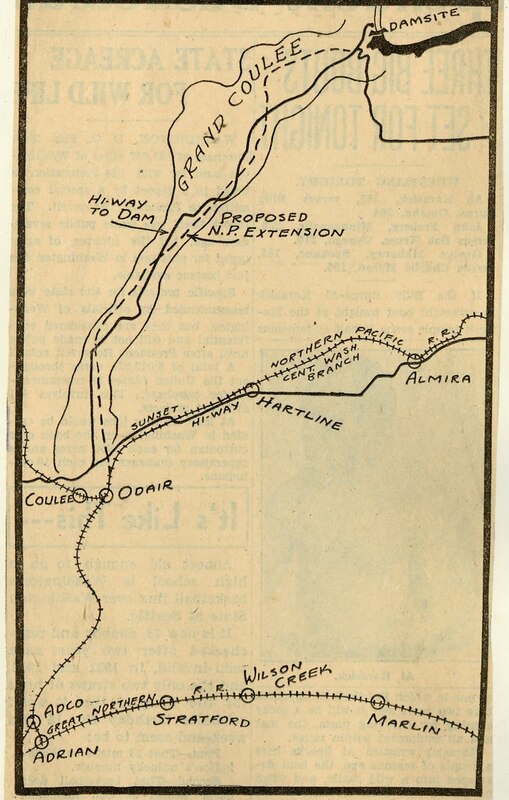 Proposed rail route to Grand Coulee. - Route of the proposed Northern Pacific rail extension to the Grand Coulee dam site is shown by the broken line in this drawing. The interstate commerce commission granted authority to the railway Monday to build the line from Odair, northeast up the Grand Coulee to the dam site. The Great Northern and Northern Pacific have proposed to build the line jointly. The Great Northern would tap the extension from Adrian, as shown on the drawing. 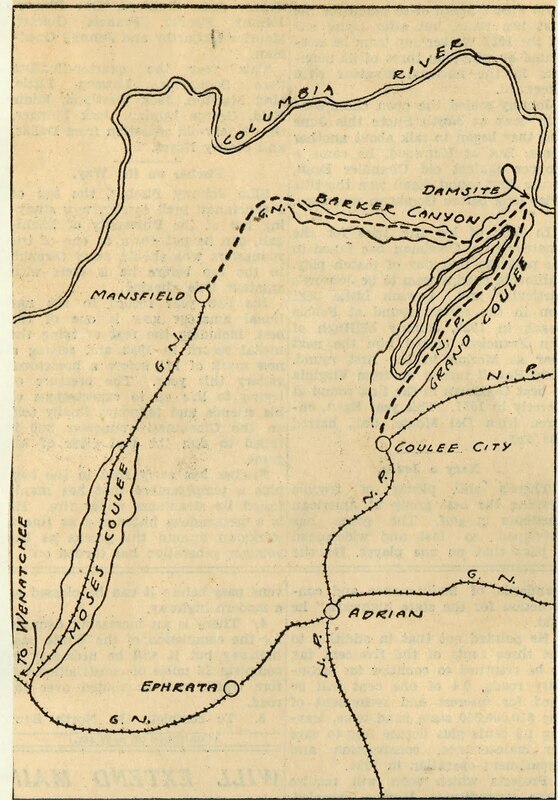 From the "History of The Big Bend Country." 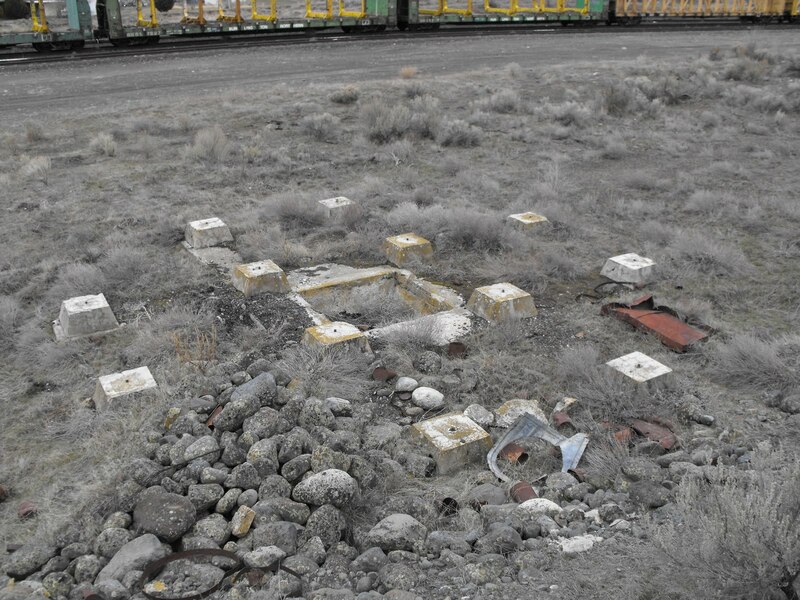 The Central Washington railroad reached Almira in the fall of 1889 and the place opened up with bright prospects. But cold weather came, accompanied by snow as building operations were commenced, and nipped its ambition in the bud. Had the road reached this point a few months earlier, Almira would, doubtless, have been a good-sized town by the time winter set in. As it was it did not assume metropolitan appearances that fall. It became a typical railroad town. It was known that the road was to be extended westward the the following summer, and the buildings erected in the main were of a temporary character, the absence of paint being a striking feature, yet adding somewhat to the picturesqueness of the village. 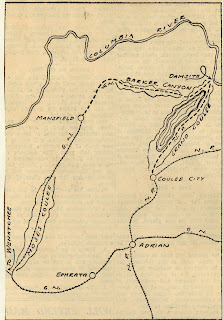 Until the road was completed to the Grand Coulee Almira remained the terminus. All trains ran to this point, connections by stage being made to points westward. 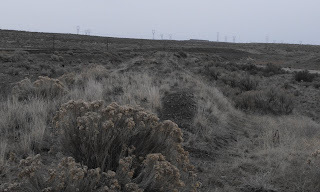 These facts made the town furiously active, but it was freely predicted that the construction of the road to the Coulee would prove a death-knell to the hopes of Almira. Wilbur was platted in April, 1889 by Samuel Wilbur Condin (Wild Goose Bill). In may of that year the building of a railroad to Wilbur had become an assured fact. 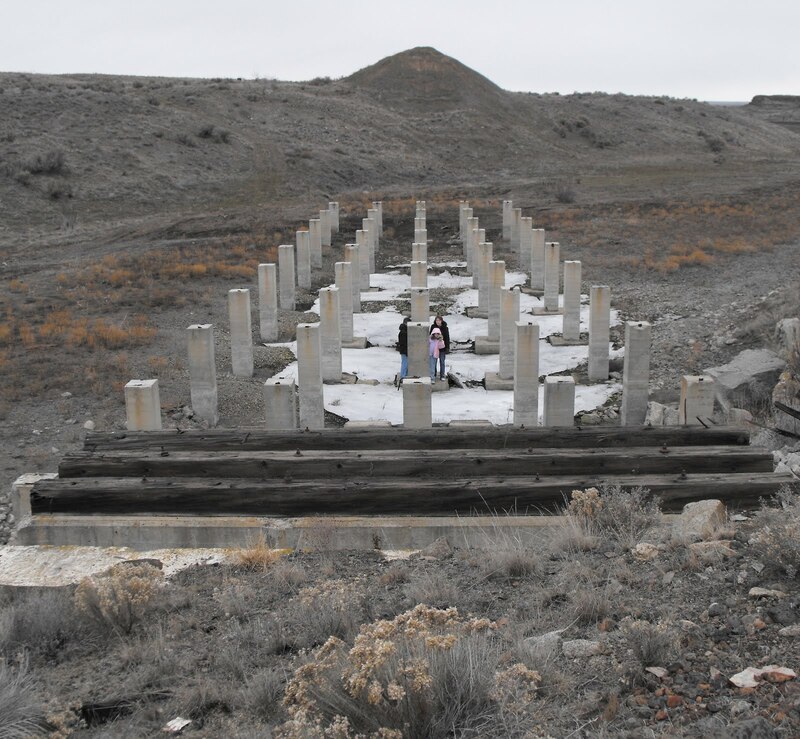 Surveyors were put to work establishing a grade through the rocky canyon and officials high in authority in the Central Washington Company announced, without reservation, that the road was coming to Wilbur. 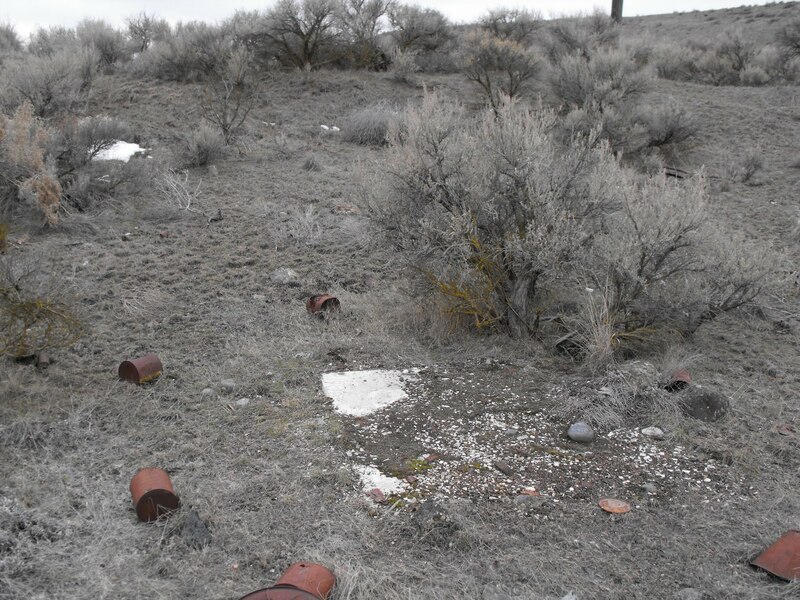 Authenticity was given to this information by the activity displayed by railroad officials in securing interests in the Wilbur townsite. Messr. Huson, Riordan, Ashton and other members of the Columbia Townsite & Investment Company, composed of parties of the "inner circles" of the railroad company visited Wilbur and had a conference with S.W. Condin, owner of the Wilbur townsite, and Rolland J. Reeves, who represented Mr. Condin. The townsite buyers came prepared to entertain any proposition Mr. Condin might have to ffer in consideration of the railroad locating a depot in Wilbur. Condin left it entirely to the gentlemen to say what the new road desired. 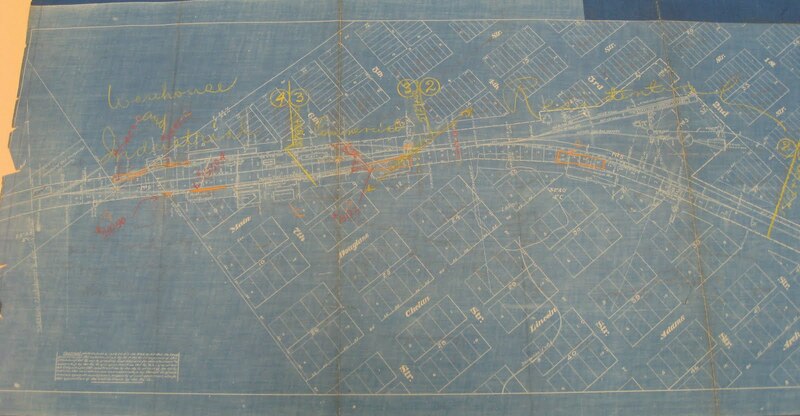 Their proposition was one-half interest in the original townsite and the addition, as well as in the proceeds of sales made, and a like interest in an unplatted eighty-acre tract of deeded land adjoining, in consideration of which the road would locate a depot on the original townsite before the close of the year. Mr. Condin asked for, and received time to consider this proposition, and, being materially aided by lot owners in the new town, concluded to accept the terms of the railroad men. Thus the management of the Wilbur townsite passed into the hands of a company of energetic men who possessed ample capital and vim with which to develop the resources of the town. Way back when, Adrian was an important junction point between the Great Northern mainline and the Northern Pacific Central Washington branch/Connell Northern branch. The NP crossed the GN on a large wooden trestle, but there was an interchange track to the east. While all of this is now gone, here is a map that helps you see what once was at Adrian. Note the map has a 1910 date and says Douglas County, even though Adrian became part of Grant County in 1909. You can see this was a busy place back then. What is left today? The two tracks coming in from the left, and then the two tracks just north of them. There is no crossover between the main and siding to the east of the depot. Nor is there a depot, or any other structure. 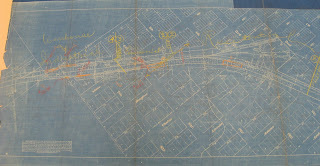 This map does not show the wye track that used to be there, on the southwest side of the map. 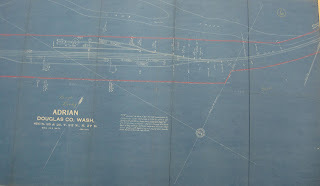 You can visit Adrian today and see the turntable pit, and the water tank footings, plus some large pieces of concrete. Special thanks to Aaron Schwarz for the map. Creston, so named because of its elevation, being the highest point on the Central Washington railway came into existence with the building of this road in 1889. 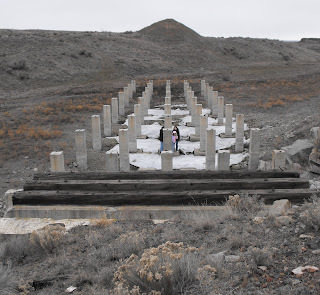 The townsite was railroad land.